FILE - Lebanese Finance Minister Ali Hassan Khalil speaks during a press conference in Beirut, Lebanon, March 30, 2017. Lebanon's new government will agree to implement all the economic reforms the country promised at an international donor meeting last year, its finance minister said on Tuesday after talks to set policy. Rival parties formed a new unity government on Thursday after nearly nine months of wrangling. Like the previous coalition, it is headed by Western-backed Prime Minister Saad al-Hariri and includes most major factions. 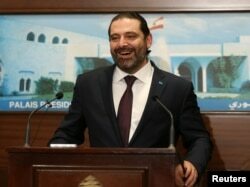 Lebanon's Prime Minister Saad al-Hariri reacts, after the announcement of the new government at the presidential palace in Baabda, Lebanon, Jan. 31, 2019. Since the government was formed, a cabinet committee has been working on a draft statement of government policy that will be put to parliament. The ministerial statement will include all the reforms contained in a Paris conference of donors and the commitment to reduce the deficit and carry out fundamental reforms in various sectors, Finance Minister Ali Hassan Khalil told Reuters. At last year's conference, donors pledged more than $11 billion in infrastructure investment in Lebanon to help boost its weak economy, on condition the country carries out economic reforms. Hariri pledged at the conference to reduce the deficit as a proportion of GDP by a total of 5 percent over five years. Lebanon has one of the world's highest levels of public debt, equivalent to around 150 percent of gross domestic product. The policy statement will be put to cabinet for approval on Wednesday, before it goes to parliament, and will maintain the existing position of keeping out of regional conflicts like Syria, Information Minister Jamal al-Jarrah said earlier. Lebanon declared a principle of "disassociation" in 2012 to keep the deeply divided state formally out of regional disputes such as the lengthy war in neighboring Syria. Washington had urged it to uphold that after the Iran-backed Hezbollah group gained more influence with another seat in cabinet. Despite the disassociation policy, the heavily armed Hezbollah has been fighting for years in Syria alongside President Bashar al-Assad. "We as a state are committed to distancing ourselves from events in the region," Jarrah said. Hezbollah's bigger role — with three seats out of 30 in cabinet — reflects the greater clout it has obtained from involvement in Syria and gains by allies in May's parliamentary election. The U.S. government has urged Lebanon's new government to ensure resources do not help Hezbollah, which it deems a terrorist organization.